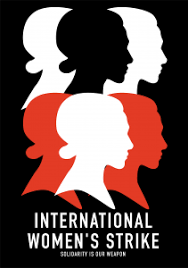 The International women’s strike on March 8, 2017 took place in 50 countries. The international committee, of which the US committee was a part, held regular meetings, coordinated actions, and learnt from each other’s tactics in the period building up to March 8. Each country had its own national committee, and the national committees further had local committees. The international committee consisted of women from diverse political traditions. There was a high degree of democratic debate, sharp disagreements and underlying that—an urgent political desire for unity in action. In the US, some form of action —ranging from workplace strikes and demonstrations to workshops and conference— took place in 14 major cities, including, NYC, LA. Chicago, SF, Philadelphia and others. Three School Districts, Alexandria City Public Schools in Virginia, Prince George’s County public schools in Maryland, and the Chapel Hill-Carrboro school district in North Carolina closed down. When Did Solidarity Among Working Women Become a 'Privilege'?